Working for a non-profit is in my blood. Before he came to the United States and became a professor, my dad worked in India for CARE, the humanitarian organization working directly with the poor to combat world poverty. Before becoming a professor herself, my mom attended Antioch college, a unique liberal arts college where the students alternate each quarter of school with a quarter of cooperative work. It was really no surprise that I went to work for the ACLU. 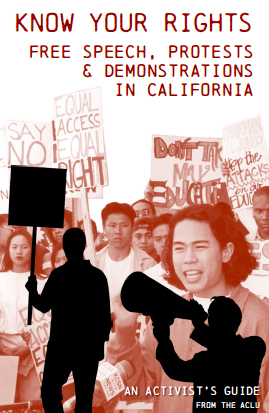 When I'm not off writing mysteries or photographing mysterious subjects like gargoyles, I spend my days as a graphic designer producing publications for the ACLU of Northern California. The mission of the ACLU is to preserve and promote individual civil rights and liberties as guaranteed by the Constitution's Bill of Rights. That includes important rights such as free speech, due process, and the right to be free of unreasonable search and seizure. 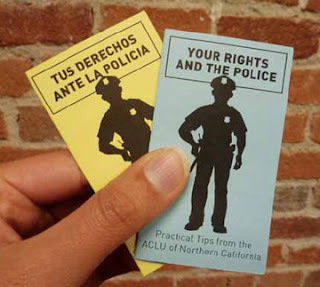 Some of my favorite projects are when we create public education materials in our "Know Your Rights" series, such as rights with the police and the rights of demonstrators, shown below. I've been so fortunate in my life that it never occurred to me to do something different than work someplace that would help people. When I leave work, I'm refreshed rather than tired. So maybe I'm helping myself, too. It's nice, isn't it, coming from a non-profit background? My dad was always employed by non-profits, community building, etc., and I love that both my sisters have continued that. I think had I not gone into emergency services, I would have too. ACLU ROCKS, and so do you.